Jiban Bima Tower (14th , 15th , 16th and 20th Floor). 10, Dilkusha C/A, Dhaka-1000, Bangladesh. 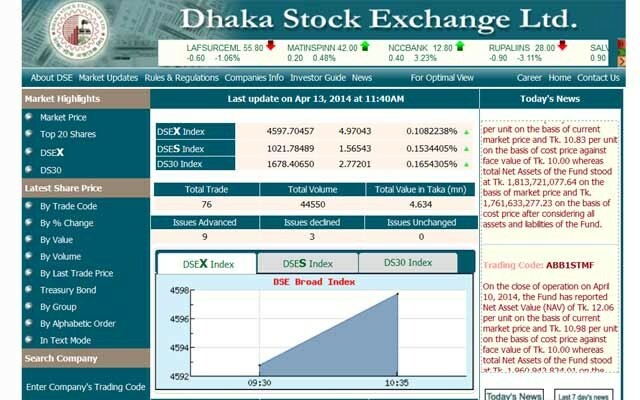 Dhaka stock exchange (DSE) is a public limited company managed by company act 1994, SEC Act 1993, SECR 1994, Security exchange inside trading regulation 1994. 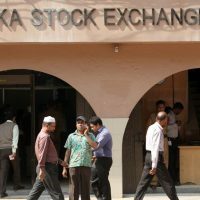 Total members of Dhaka Stock Exchange are 328, listed companies are 538 and market capital $50.28 billion on April 05. 2010. 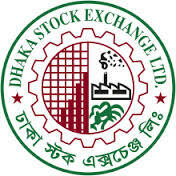 Dhaka Stock Exchange is operated by 25 members Board of Director, 12 members are elected from DSE member, 12 members are selected from association or organization of Bangladesh including Bangladesh, DCCI, FBCCI. 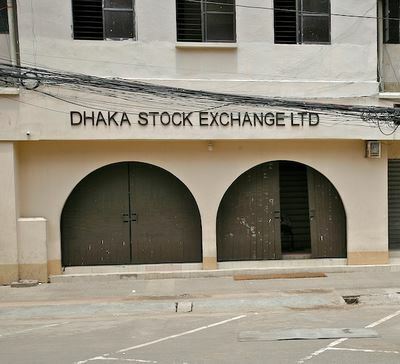 Chittagong Stock Exchange Building, 1080, Sk. Mujib Road, Agrabad, Chittagong, Bangladesh.